Alright, here are the four photos to vote on. Photo #1. I like this photo for the lighting, details, and the tentacles sweeping to the right. Photo #2. I like this photo because he's looking at me. Photo #3. The color patterns on this discus is gorgeous. And Photo #4. The main event. 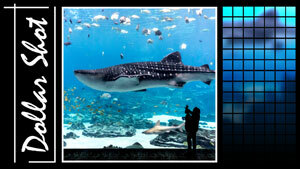 A whale shark. So, which photo do you like most? Vote in the poll or leave a comment below. So let's continue building our FujiFilm Instax photo album and see what the next photo will be. And this time it's a 2 for 1 deal. What do you think? Hope you enjoyed and see you back here for the next one. Thanks for watching!